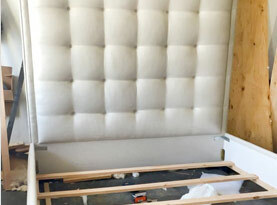 The master craftsmen and design professionals at Designs & Interiors by The Upholstery Shop have served residential home and commercial business owners in Northern Virginia and the surrounding areas for almost 40 years. Our company is 100% dedicated to each and every client which has allowed us to build a reputation for a high quality personalized service that has given our company the ability to progress from a small workroom to a large showroom offering one-of-a-kind customized services using a wide range of material and fabrications. 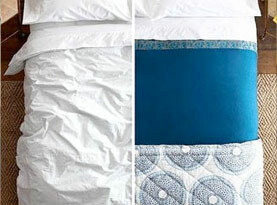 The most important element for every custom upholstery, drapery and slipcover project is the fabric. The experts at Designs & Interiors offer literally thousands of beautiful fabrics for you to choose from. Our skilled and knowledgeable team of professionals will help you find the perfect match for your project. A good quality piece of furniture is made to last but fabric can become damaged by general wear and tear leaving you with a less than desirable appearance. Our re-upholstery services are designed to breathe new life into your sofa, chairs, loveseats, sectionals and ottomans and make them look and feel just like new. 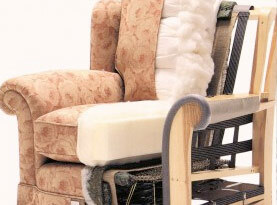 Our re-upholstery services don’t just replace the old fabric with a new one; we will also replace broken springs and damaged foam to keep your furniture in tip-top condition. Unlike store purchased slipcovers, our custom made slipcovers involve the process of making a perfectly fitted cover for any of your furniture pieces. Our slipcovers are a cost effective alternative to changing the temporary fabrication of your furniture without the cost of re-upholstering for a permanent look. We can provide slipcovers for all styles and tastes from loose shabby chic to a slip cover that fits so well that your guests won’t even realize that it is a cover. Custom window treatments and drapery can change both the appearance and add a touch of beauty to any room in your home. Our experienced team of design professionals will work with you to customize window treatments from draperies, shades; blinds and everything in between to show case your home or business to perfection. Once you have selected the type of window treatments for your home, we can help you select a custom cornice to add dimension, balance and finish to the room. We have a wide variety of cornices available that can be custom fitted to suite the décor of your home or business. At Designs & Interiors by The Upholstery Shop, we specialize in both decorative and functional pillows. We can make pillows to your exact specifications and have a wide range of exceptional fabrics available for you to choose from. 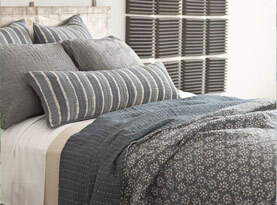 From throw pillows, pillow shams, bolsters and more we provide everything to complete your made-to-order items. Some of our most popular fillers include feather, down, faux down and polyester fill. In addition to our upholstery and soft furnishing services we proudly offer an exclusive line of furniture that is designed to complement any style home. Our quality furniture collection includes chairs, benches, ottomans, sofas and custom headboards along with many other items. Our custom pieces are available in a wide assortment of styles, finishes and fabrics from classic designs to contemporary styling we have the idea pieces for your home. For more information about our upholstery and design services, contact the professionals at Designs & Interiors by The Upholstery Shop and schedule your design consultation today.